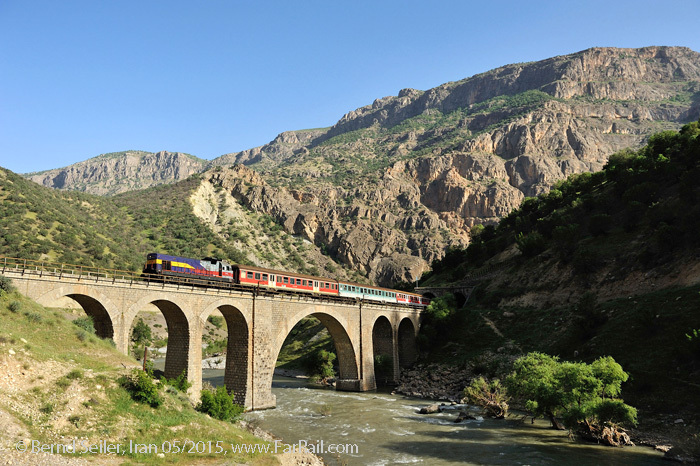 After a successful Iran tour in 2016, we changed the itinerary, added some lines, including the electrified one in Tabriz, and asked for more railcar services to reach positions which are really off the beaten track. When thinking about the world’s most spectacular railway lines, you immediately think about the Central Railway in Peru, crossing the Swiss Alps or the Darjeeling Himalayan Railway. But have you ever thought about Iran? You may have heard about the ‘190 Railway Operating Company’ which emptied shiploads of mainly oil-fired 8Fs into Iran to master the Trans-Iranian Railway and deliver war materials to Russia in WW II. 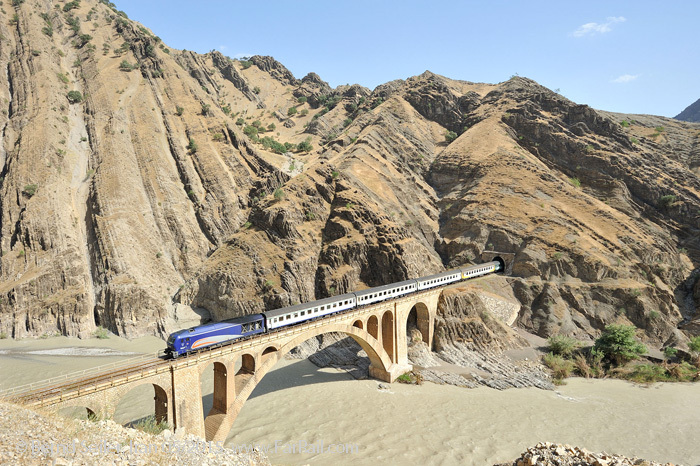 The Trans-Iranian Railway connects the Persian Gulf with the Caspian Sea via Tehran and, in achieving that, it climbs and falls more than 2,000 metres to leave one sea and repeats this to arrive at the other sea. For good reasons, many of today’s photographers have never made it to Iran. This is primarily because, for decades, sanctions have been in place and railway photography was and still is strictly prohibited. But along the line in small villages no-one really cares about the law. Nevertheless, most stations have a police station and being careless might cause some trouble. In October 2015, on a preparatory tour for the tour in May 2016, I went to the main station building in Tehran where I hoped to take a photo in the main concourse of a relief illustrating a steam train. Instantly, an official arrived with the words, “if you take this photograph I will need to confiscate your camera”. However, he was a 60th of a second too late! However, as we were travelling with an official from the State Railways, the security police took him to one side for a couple of minutes to “sort things out”. But following our Golden Eagle Luxury Train tour and a visit to the headquarters of the railway, I believe for the first time we have been granted a photographic permit for a small group of enthusiasts to take photographs over what I believe to be one of the most spectacular railway journeys worldwide. As we ran a first tour for photographers to Iran in 2016 we found much freedom of photography in the rural mountains. But of course, the railway man, accompanying us, had to explain several times what we were doing and show the permit from Tehran. On one occasion a 4WD car from the Revolutionary Guards followed us the whole day through spectacular mountains. Most of the pictures shown here are from this first public tour in May 2016. The political situation seems to be stable these days. Iran is actually one of the most stable countries in the region. However, there may be only a narrow window in time when the state railways will allow photography on their superbly scenic lines and of their approximately 40 year old American diesel locomotives. As well as the railways, you’ll have the chance to see some of the impressive remains of the ancient history of Iran, including one of the oldest, continuously used cities in the world. Iran is a very safe country to travel through despite the negative touches of many western reports. It has friendly, interested people, tasty food and many totally unexplored sights, well off the beaten track. Many of these fascinating attractions have never made it into a ‘Lonely Planet’ guide. I would strongly recommend a visit to one of the most interesting and challenging railway lines of the world! You will be impressed. Don’t miss this opportunity. After visiting this country, I can only say that I am enthusiastic about what I found culturally. And regarding the railways, thrilled would be the word to describe what is there to be found between deserts and mountains. This country is, for me, a new discovery and a number one destination. Have you seen a rock face, towering 150 metres above and alongside the rails? Impressive? You should go to Doroud! 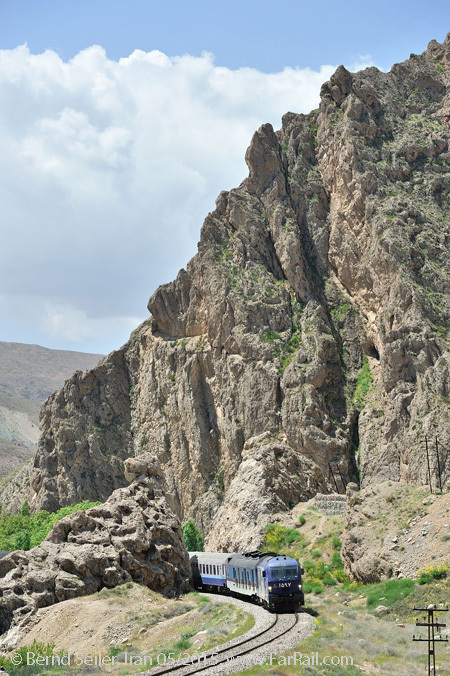 Between Doroud and Andimeshk rocks loom large and almost vertical right beside the railway line to 500 metres, 800 metres, and, yes, even more than one kilometre. And between these intimidating, towering mountains our great grand fathers dynamited a masterpiece of civil engineering with deep cuttings, tunnels, high bridges and spirals through the Zagros and Elburz mountains. The US troops called the section between Andimeshk and Doroud the “subway”, with so many long tunnels following one after another on this line. The bridges between these tunnels are reminiscent of the central European ones from the 1920s. And then there’s the northern ramp of the Trans-Iranian Railway. The gradient here is even stiffer (1:36) as the line winds its way up into the mountains, enough to make you feel giddy. It is said that the Austrian engineer responsible was asked by Reza Shah to stay together with his family under his bridge when the first official train ran over it to prove that he trusted his long bridge, some 100 metres high and 65 metres long. He did as he was asked, and he, his family and the bridge survived. The latter, until today! The necessary photo permit is hard to impossible to get, at least for the independent traveller. But with the deal to charter a train in exchange for the photo permit it worked in 2016. And for the tour in 2017 we’ve also arranged a number of railcars to make it possible to reach some of the most spectacular sections of the railways. Arrival in Sheykhsafi 05.58 hrs. 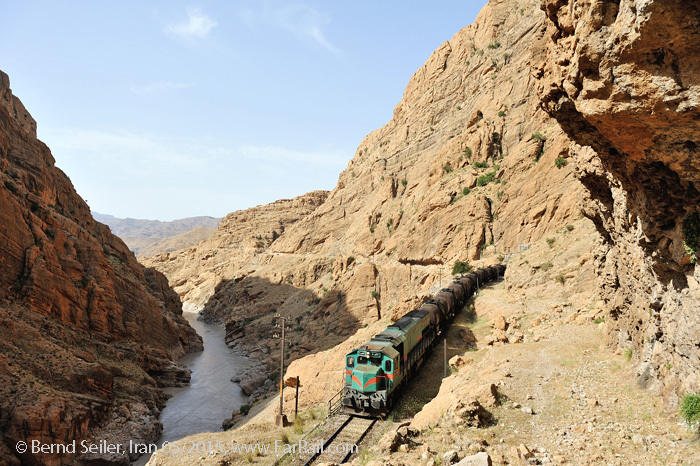 With railcars, we’ll explore the spectacularly scenic section Sheykhsafi  Khorasana, inaccessible by road. Morning visit to the depot of Tabriz. They host the eight ASEA electrics from 1979/1980 which are in use on the Jolfa line. By charter bus, we’ll explore parts of this line and take pictures of the passing trains. In the late afternoon we’ll continue to Khoy; Samin Hotel near Khoy. By charter bus we’ll go to the spectacular Ghotour bridge (ca. 20 km) and take some pictures of trains. In the late morning we’ll head back to Tabriz. Flight Tabriz  Tehran ATA Air 14:30  15:30, changing flights in Tehran and continue by Naft Air 2608 18:00 to 19:00 hrs to Yazd. Charter bus to Bafq and hotel in Bafq. 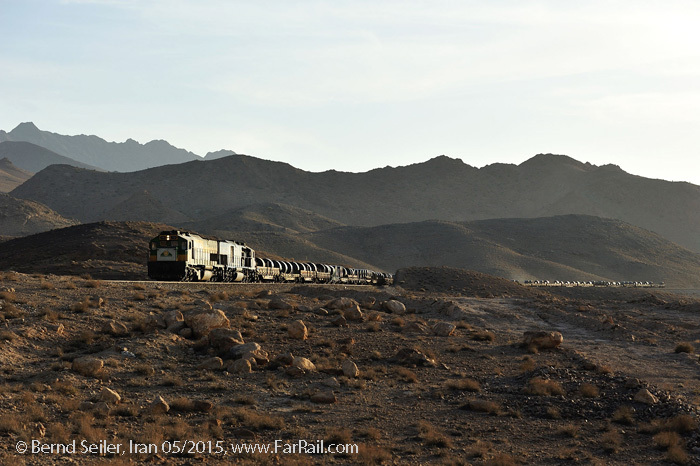 In the morning we’ll visit the busy line Yazd  Isfahan. Those with a general interest in culture can visit a small, non-touristic Caravanserai near the railway line which has been unused for decades. Around noon, when the sun is too high for any useful photography we’ll go to Ardekan and have a look into the historical, private Taghdiri house. At 14.49 hrs we’ll go aboard train 627 which will bring us to the suburbs of Ghom. We’ll arrive at 18:07 hrs in Mohammadiye. Minibuses will pick us up and bring us to a nice restaurant and later to the main station in Ghom. At 20.33 hrs we’ll board overnight train 150 from Tehran to Andimeshk. Accommodation in sleeper compartments. At the small station of Shabazhan (Qapi) we’ll leave the train at 05:34 hrs. 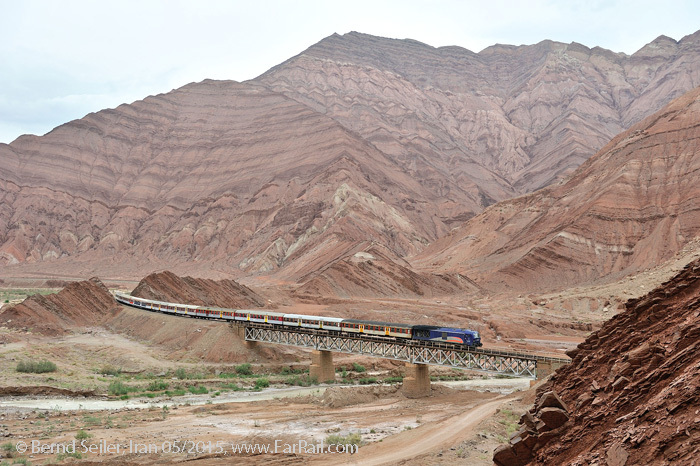 From here we’ll explore the ultra-scenic section between Shabazhan and the Sirom bridge north of Tang Haft using hired railcars. We’ll return to Tang-e Panj, where train 131 stops at 19:45 hrs which will bring us to Bisheh. Arrival at 21:48 hrs. In Bisheh we use a very basic guesthouse, the only suitable accommodation within reach. Minibuses will pick us up from Bisheh and bring us along the very scenic line to Doroud. We’ll explore the upper section between Bisheh and Doroud. In the afternoon we’ll return to Doroud and board overnight train 180, departing at 18.31 hrs from Doroud. At 05:36 hrs we’ll arrive in Semnan. Here we’ll be picked up by chartered minibuses which will bring us to Firuzkouh. We’ll explore the line within the section Firuzkouh  Zarrin Dasht. In the evening we’ll return to a recently built guesthouse in Firuzkouh. Mid Morning visit to the depot of Tehran. In the late morning we’ll return to our hotel to have a shower and check out. Return flight from Tehran, flights can be booked by FarRail Tours if required. Breath taking. There is nothing more to say. Maybe, you’ll need a wide angle lens to get the complete mountain scene, together with the railway, in the viewfinder. 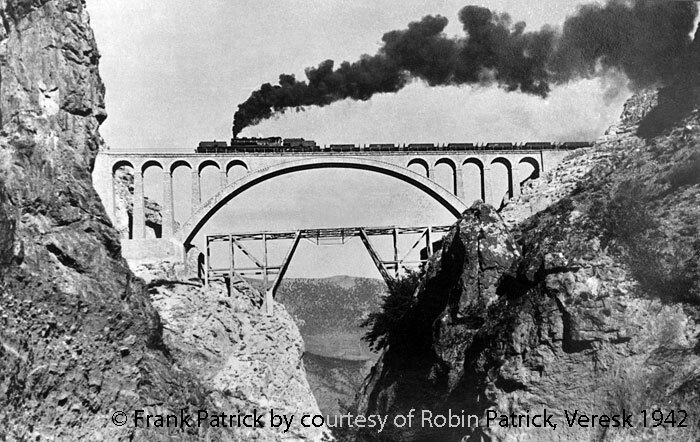 It took a long time before Iran built the first noteworthy railway line. Iran, at that time still called Persia, had fallen victim to the whims of foreign interests. The UK and Russia feuded over their influence and interest in the region and this impeded the construction of a railway in Persia. There were several attempts, but they all failed except the 9 km long metre gauge railway from Tehran to Ray and the mosque Abd-al-Azim, but this railway never gained economical relevance. The first lines were finally opened during WWI, as Russian, Turkish and British troops occupied the country. 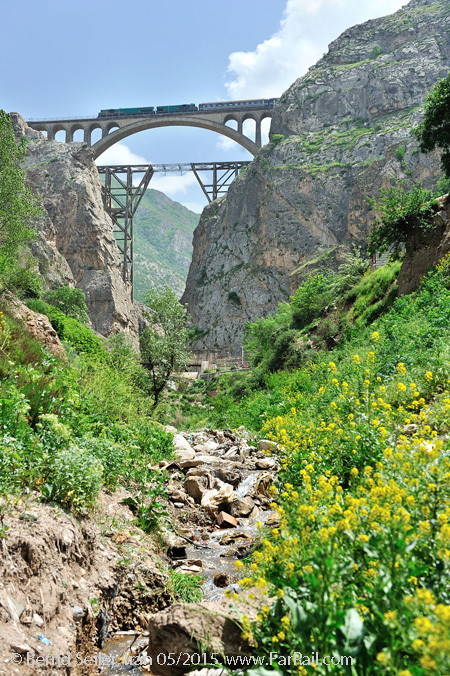 Besides a number of military and industrial narrow gauge lines, especially in the oil fields and the northern forests, the first, 148km long, line from Tabriz to Jolfa was opened in Russian broad gauge (1524mm). Otherwise, Persia remained a blank area on the railway map, until a 1676mm broad gauge extension from British ruled Quetta in India (today Pakistan) from Mirjaveh to Zahedan was opened in 1921. This line remained isolated and economically marginal until 2009. The railway age only really started after Reza Shah Pahlavi recognised a modern transport system as important for the future development of the country. Other countries had almost erected their entire networks by the end of the 1920s, while in Iran construction only started in 1927. Although foreign powers preferred an east-west line (and preferred even more an Iran without a railway), Reza Shah aimed for the more important north-south connection between the Caspian Sea, Tehran and the Persian Gulf. He avoided external influences by introducing a task-related tax on sugar and tea, both upon which the state had a trading monopoly. One of the most spectacular railways was financed from these taxes. An American-German consortium started construction in the low lands of the north and of the south from 1927 onwards. In 1933 the Danish-Swedish consortium, Kampsax, took over and planned and co-ordinated the construction of the mountainous sections, ie. some 1,000km of railway line. They split the contract into 50km long sections and subcontracted many Austrian, German and Italian companies to complete the line. For the construction, ten two cylinder 0-10-0 compound locomotives were purchased from Austria and these remained in Iran after the completion. The Trans-Iranian Railway went from Bandar Shah at the Caspian Sea via Ahwaz, Andimeshk, Doroud, Arak, Ghom (Qum or Qom) and Teheran to Bandar Shahpur at the Persian Gulf. The 1,392km long line climbed twice over passes of more than 2,000 metres above sea level and fell in between to 1,200 metres below in Tehran. The complete line was handed over by Kampsax in 1938, several months ahead of schedule and below the calculated costs. The esteem of our great grandfathers’ work rose further if we compare their performance with today’s infrastructure projects. 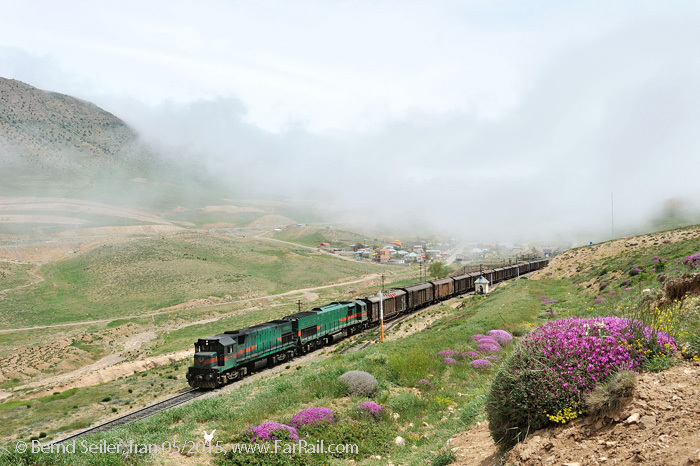 The Trans-Iranian was the foundation of today’s network of railways in Iran. It had less than three years of peaceful operation. When British and Soviet troops invaded Iran, they demanded the eviction of all Germans and arrogated Reza Shah to abdicate and leave the country. The railway was taken over by British and Soviet troops and became the famous “Persian Corridor” to supply lend-lease military material and fuel to the Soviet Red Army “through the back door”. But the line wasn’t built either for military use or for the daily shipping of thousands of tons. Nor did they have any appropriate rolling stock available. The backbone of the railway was the 49 2-8-0 locomotives from the German builders Krupp, Henschel and Maschinenfabrik Esslingen (known as “Ferrostaal locomotives” after the Kampsax subcontractor) and the 16 2-10-0 locomotives from Henschel. Besides these, the Iranian State Railway owned 12 Nohab built 2-8-2s which were unsuitable for the mountain lines and four very powerful 4-8-2+2-8-4 Garratts from Beyer Peacock for the steep and long gradients of the northern ramp between Pol-e Sefid up to the summit near the station of Gadouk. 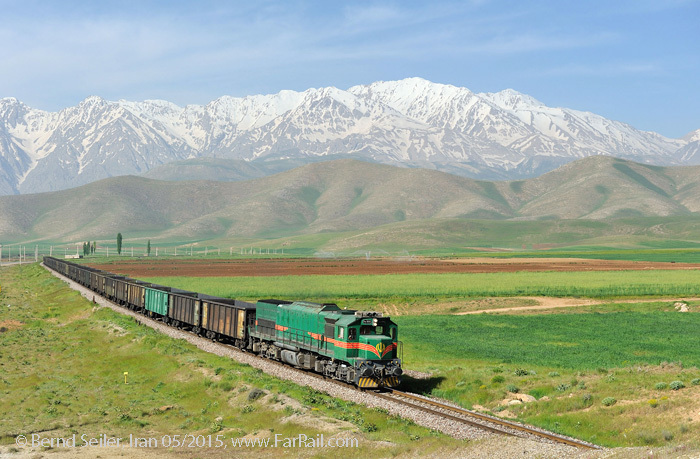 Before the invasion of Iran, the Trans-Iranian Railway handled about 200 tons of freight each day. The British troops reached 1,530 tons on average per day in late 1949 while the US troops topped that with 6,489 tons per day on average in 1944. In the Soviet zone they used mainly German locomotives and, after repair in the Tehran workshops by British men, the four Beyer-Peacock Garratts. 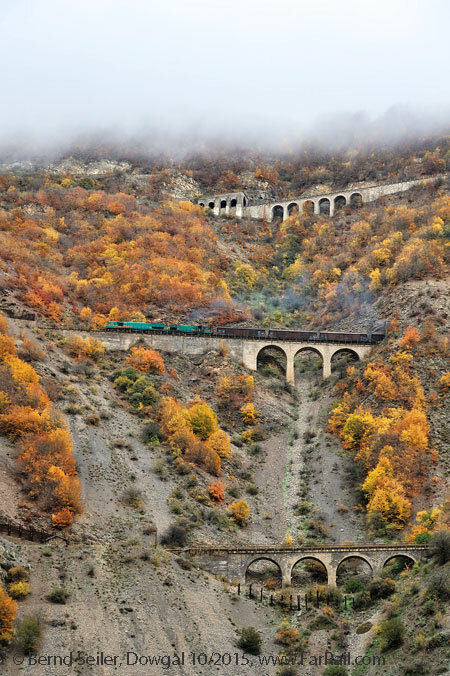 The Russians had to master the steeper gradient, but they didn’t need to cope with as many tunnels as the railwaymen on the southern section between Andimeshk (146 metres above the sea) and Doroud (1,454 metres above the sea). In addition, water supply in the Soviet zone was much easier. In the British zone it was in permanent short supply before collapsing totally. Several stations had to be supplied with tank wagons. Boiler wash-outs were difficult due to the shortage of water supply, and in the days before internal water treatment was introduced boiler wash-outs were a frequent task for the railwaymen. Water, boiler conditions, injectors and emissions in the tunnels remained a permanent challenge until the US troops introduced the Alco RSD-1 diesels which had to be run double headed on the steeper sections. Today road traffic is preferred by the politicians. Motorways are constructed, cheap and sometimes subsidised fuel makes car driving affordable for many. Trucks are the backbone of freight traffic. At the turn of the last century, Iran had some 12 million inhabitants, nowadays there are roughly 80 million Iranians. This leads to an enormously increased demand for transport, but also to hefty pollution in the megacities and a large number of traffic deaths. Only 9% of transport is handled by rail. That’s why Iran announced an ambitious railway construction programme, spoiled somewhat by the Iranian Revolution of 1979, and the even newer sanctions introduced because of their nuclear programme. However, since the 1990s, many lines have been handed over to traffic and the investments are ongoing. The first high speed line between the megacities of Tehran and Isfahan is under construction. For a long time on the “to do” list is the electrification of the double tracked line, Tehran  Mashhad. There are also ideas for turning this into a high speed line. Probably only after the sanctions are lifted and the oil price has recovered, will Iran have the money to finance their ambitious plans for another 850km long 250km/h high speed line. At the moment there is still a shortage of many things they can’t import easily. Many construction plans are behind schedule or stopped completely. The line to Azerbaijan, Qazvin  Rasht  Astara, for instance, should have been opened in 2011, but is still under construction. The sanctions are painful for Iran’s economy, but especially for the population. After decades of long experiences with American sanctions against Cuba and the current dilettantish EU-sanctions against Russia, it remains very doubtful if sanctions will have any influence on the politics. Just recently they signed contracts about improving their signalling system and electrifying the northern section of the Trans-Iranian. The latter contract was signed with the Russians, hence it’s very likely that it won’t be affected by the political ideas of the west. Alas the plans to electrify the line to Mashhad have died thanks to the sanctions, despite, in 2009, contracts for electrifying the important east-west line being signed, including the purchase of 70 electric locomotives. That’s why, besides the metro lines (Chinese locomotives class TM1 to TM3), the only electrified line is still Tabriz  Jolfa with eight ASEA-Locomotives. The model is based on the Swedish RC4. The line is electrified using 25kV/50 Hz. 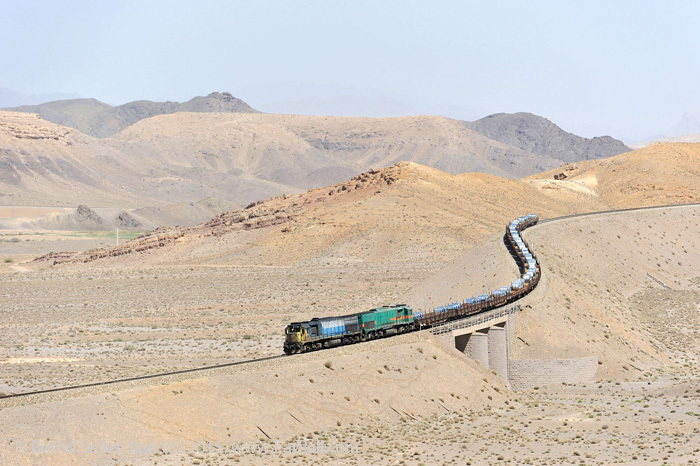 There were a number of second hand Romanian class 060DA, five Ukrainian 2M62 and one Chinese diesel loco in Iran, but they didn’t play an important role in rail transport and have been withdrawn or sent back to the countries they came from. 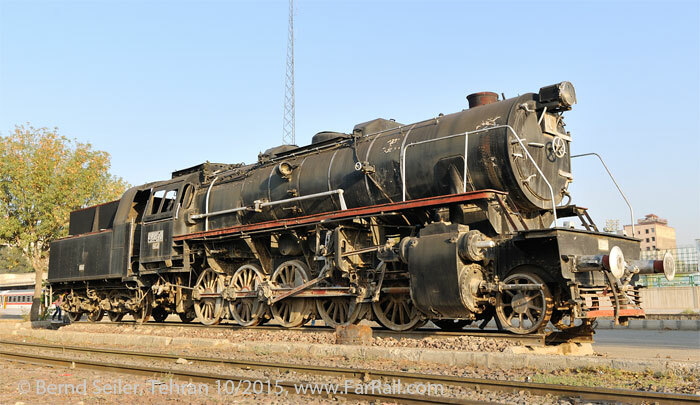 There were and are other diesel locomotives in Iran, especially for the industrial railways. While on local trains you need to be satisfied with second hand elderly Danish or German coaches there is a number of modern and fast railcars. Siemens delivered 20 Paradise DH4-1 160km/h permitted railcars. More will be manufactured by Iranian companies under a technology transfer agreement. The same happened with the (by the railwaymen) highly appreciated 160km/h fast Siemens Iran Runner, where only the first 30 units were produced by Siemens, the rest in Iran. The latest of this series have been put into service in 2016. Hyundai Rotem delivered 150 railcars between 2007 and 2009. However, the purchase of second hand British rail buses of Class 141 in 1998 seemed to be a failure, they are all parked in dump sidings now. More remarkable are the four French RTG Turbotrains, which came to the country in 1976. In 2008 they were converted to be driven by traditional diesel engines. 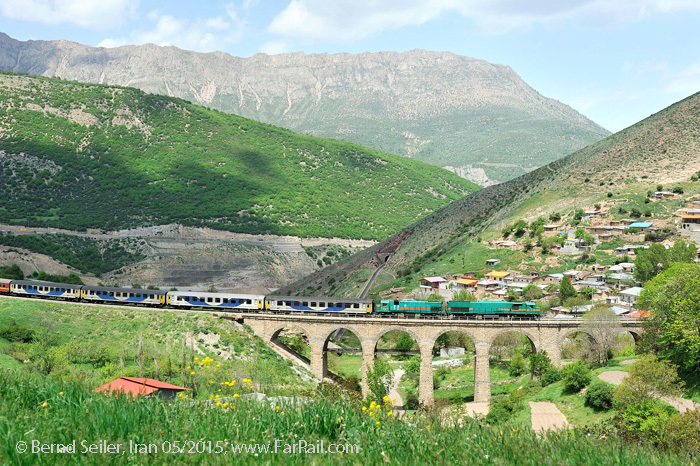 In 2015 only one could still be seen  hauled by a Siemens Iran Runner. Those Turbotrains once accelerated the speed on the classic track bed to Mashhad with jointed tracks, wooden sleepers and manual points to 160km/h. It seems that all of them are out of service now. It is to be expected that the Iranian State Railway will develop quickly once the country generates a steady income from oil and gas exports again. There is only one line with semaphores, the northern ramp of the Trans-Iranian Railway between Sari and Garmsar. 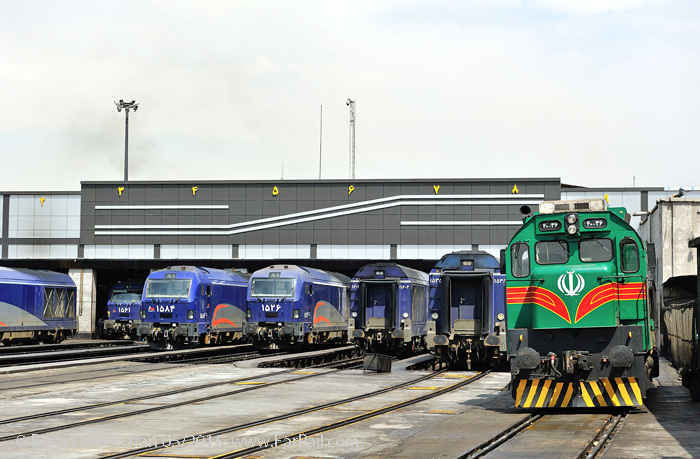 Several lines will see double tracking and the electrification of the Tehran  Mashhad line is likely. Then new locomotives will come to the country and probably replace the traditional American designs. The railway is surprisingly on time and fast. This is an enormous advantage against the road traffic  and the travellers appreciate this fact. Many long distance trains seem to be sold out days in advance. The tour is designed especially for railway photographers and video film makers with a broader interest also in the ancient culture of Iran. The focus is not laid on five star accommodations with selected chief cooks, but on taking advantage of the newly available opportunity to capture some scenes of an almost unknown and very interesting railway. This tour is not compiled for political campaigners, religious, environmental or human rights activists, investigative journalists, missionaries or notorious do-gooders. At the slightest suspicion of your motives, your participation on this tour will be denied. I have ongoing plans to open other lines to photographers and am hence not interested in anyone who aims to profile themselves in certain communities for selfish reasons and spoil the relationship with the state railways. Iran is a safe country to travel to, although your media may paint another picture. The greatest danger you’ll face when travelling to Iran is not militant Muslims (actually I only met very open, helpful and lovely people on my trips through Iran) or unknown diseases but the dense and fast road traffic  as in many other countries of the world. However, it’s not as chaotic as put about by many publications, the road traffic in the neighbouring country, Pakistan, is much worse. It’s rather simple: keep eyes and ears open and use common sense (if you haven’t lost it through years and years in your “fully comprehensive insurance” country). Be far seeing and forbearing: he who does not see a green traffic light as his right of way, is the one who returns healthy and happy from the tour! You’ll take away many good impressions from a not so well known country. Many you talk to will advise you not to travel to Iran. Always ask them how often they have been to Iran to come up with their advice. Don’t trust everything you read in a newspaper. Again, just use your common sense. If you are willing to learn a bit about the history of the country you’ll find some irritating facts, such as the Soviets killing many civilians by bombing a city. Iran was never a threat to Russia ... when looking into history you’ll also understand why Iranians might have a problem with American or British politics. They have no problems with American or British tourists however; they’re warmly welcomed. To reach the best photo positions you might be tempted to hike into the mountains. You’ll need solid footwear and  again  common sense. Always think about your own safety. Better skip climbing in tricky places if you’re not sure how it feels to fall several hundred metres. In late April/early May it’s warm and often dry  except on the northern section of the Trans-Iranian where temperatures may drop below 10 degrees Centigrade at the summit. Otherwise temperatures are expected in a range of 15 to 35 degrees Celsius. Sunrise in Arak is around 6.15, sunset around 20.00 hrs. Especially on the northern ramp of the Trans-Iranian we may experience some rain. We tried to offer a lower price for this tour compared to the first one. Hence we picked some accommodation which you normally wouldn’t choose. But off the major tourist sites the quality of hotels is basic. Even hotels in minor cities offer often only a very basic standard. 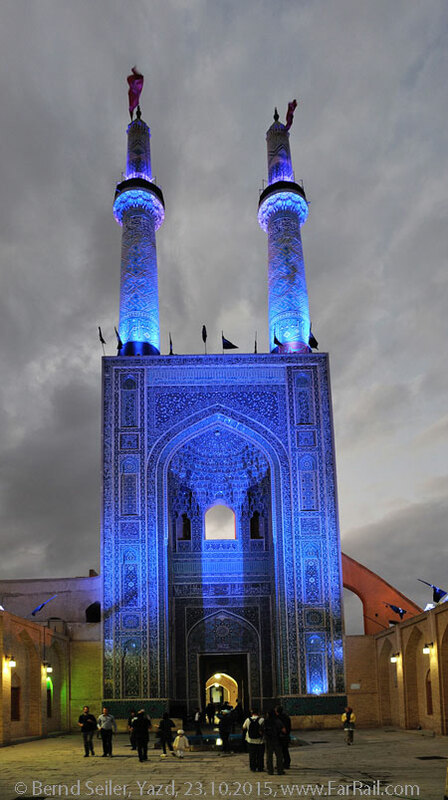 In larger towns like Tehran or Yazd, we’ll book suitably good hotels. Single rooms are available at a premium except on overnight train journeys. Electricity: 230v, 50Hz; blackouts are uncommon. In some cases you’ll need an adapter for the sockets. Mobile phones can be used, but there isn’t roaming available everywhere and where there is, it’s expensive. Internet is available in most of our hotels. It’s not the fastest, but it’s stable. Some websites are not reachable from Iran. Please do not wear high visibility clothing. We are on a photo tour! When travelling in an Islamic country you should be considerate of their rules. Short trousers are a no-no and will terminate the tour for you. Carrying drugs beyond a certain amount brings about the death penalty. Drinking alcohol is prohibited, but there is alcohol-free beer and wine on offer. Ladies need to cover their hair and neck. Our meal times are very flexible up to the possibility of cancelling the one or other meal. We’re photographically active. You’ll not starve but times and choice might be challenging for you. It is recommended that you carry some muesli bars with you. However, our Iranian tour guides will offer some snacks if there is no proper meal available occasionally. Environmental standards in Iran do not conform to European, Australian or North American expectations. Please bear in mind that accommodation and transportation may fall short of EU/US etc. safety standards. Always use common sense when crossing roads and railway tracks. Neither FarRail Tours nor the local providers can be held responsible and will not accept any liability whatsoever in the case of any accident or damage or issues caused by delays. A comprehensive overseas health insurance policy is compulsory for the visa application. We also recommend you to have accident insurance. Iranian and German guides (English speaking) - flights are without guide. * Using airlines with different arrival/departure times will cause additional costs for the airport transfer (approx. 80 Pounds one way) and hotels if required.